Have you ever worked in an organization where someone was extremely critical to day-to-day operations, yet surprisingly low on the ‘totem pole’? Have you ever been shocked by a promotion/hire that was given to someone who seemed unfit for the job in light of other, more capable, internal candidates? Did you ever wonder why management was not more aggressive about retaining a person who was almost indispensable to business continuity? This is a phenomenon I have frustratingly witnessed on many occasions during my 15 years in the corporate world and it is the kind of talent mis-management that I think is rampant in the workplace, especially in mediocre/under-performing businesses. It is estimated that the cost of turnover is roughly 1 times the salary of the person leaving (Saratoga Institute of PWC). How much more is a company losing when they fail to retain one of those hidden gems? And why is it that these people frequently go unnoticed to senior management? Part of it is probably due to natural ‘blind-spots’ that come with being a manager. When you are two or more layers removed from day-to-day activities, it is easy to lose sight or touch with who the key lynch-pins are. Some managers are very connected to their employees and understand the spectrum of talent across their team; however, as you move up the chain of command, the accuracy of this perception can get thwarted and skewed. The disparity between management perception and reality, in this respect, and how mapping informal networks can help bridge the gap, was discussed at length in this Harvard Business Review article. I like this article because it not only points to a common problem in the workplace, but provides a powerful solution as well. Organizational network analysis (ONA) gives management a view into their company, based not on any one person’s point-of-view, but rather an aggregate of everybody’s perception. It capitalizes on the power of the wisdom of crowds, and delivers a much more accurate picture (literally) of who the key influencers are and where the hidden talent lies. My own experience with ONA, through Keyhubs, has further reinforced this observation. 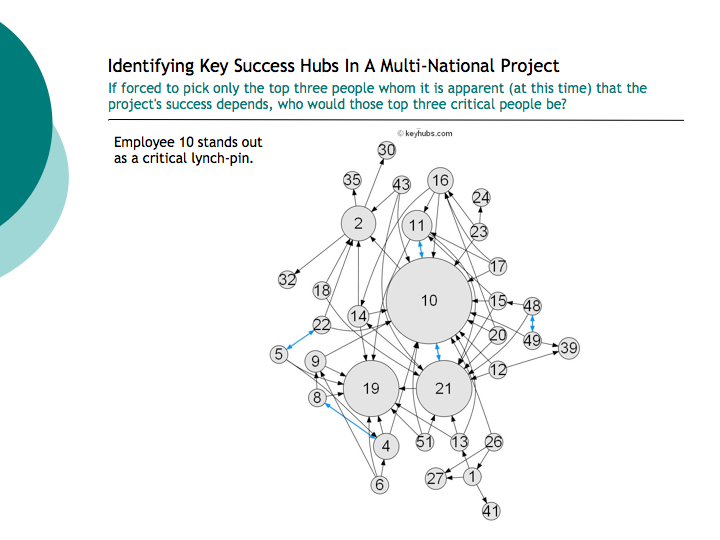 In one of the first network analyses I did (while in business school), we evaluated the knowledge hubs within one of my classmates’ company. 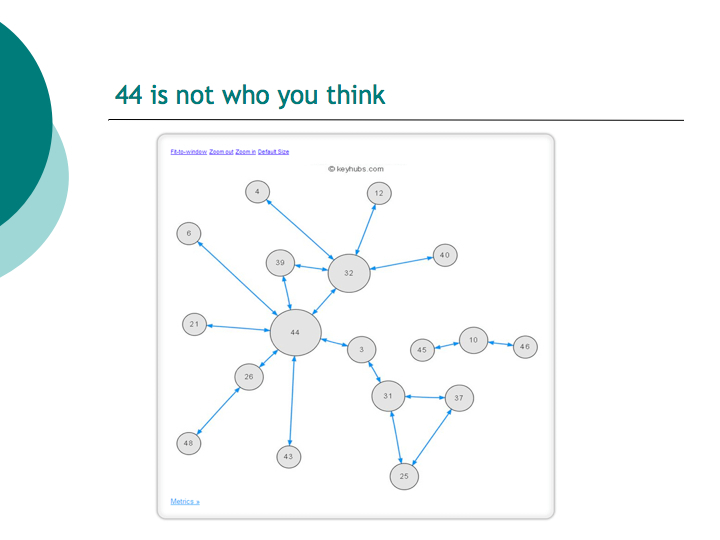 When I showed her the following anonymized network map and asked her to guess who 44 was, she rattled off several names: the CEO, various VP’s….she went down the line until she gave up guessing. She was quite surprised to discover that employee 44 was the company’s sales operations specialist, one of her own direct reports! 44 was low in the formal hierarchy, yet so central/critical to the flow of important information. If 44 goes, many parties are left isolated. Following is a project we did with an energy generation firm. They were interested in understanding who the ‘key hubs’ were on one of their large-scale, multi-national projects. When we showed the following map to their executives, they were quite surprised about who employee 10 was. Executives would be in a much better position to evaluate, manage and reward talent, if they could see where each employee sits in the various informal networks that permeate the workplace. Organizational network analysis (also called social network analysis) is exposing the perception/reality mismatch and helping firms identify the hidden lynch-pins that are central to critical operations. If you have a story or experience about talent and influence transcending hierarchy, please drop us a note! I liked the way you brought out the key points almost as if you were telling a story. Very engaging and very relevant! Thank you so much for the feedback! Glad you enjoyed it. Thanks for this clear description of the value of network analysis. We made similar surprising discoveries using “Keyhubs” on a client project. It helped us make decisions that unblocked some bottlenecks and redistributed responsibilities to better align with people’s talents. Thank you for the post! Hope to see you soon. 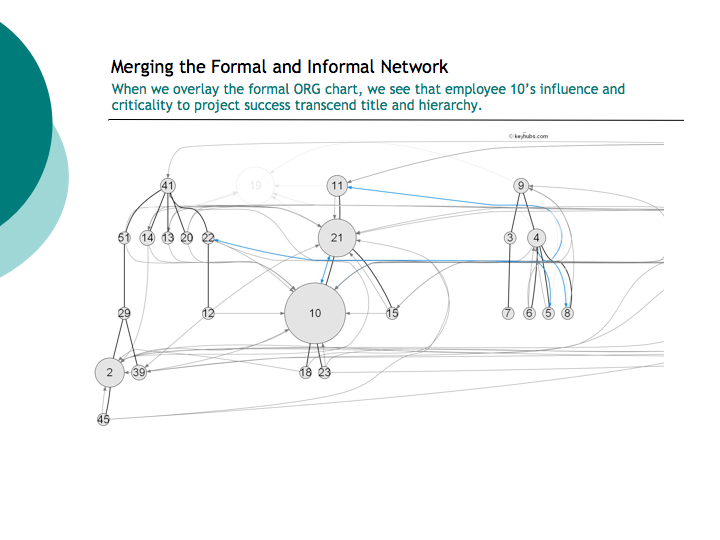 Compelling insight, I really appreciate the way an intuitive social heirarchical trust network can be organized and integrated with an organizational corporate network. This is insight is SORELY lacking in many organizational groups today. I am forwarding this to the CEO of a former radiology group I was a partner in, who is struggling to develop the insight your article outline. Thank you for the feedback — much appreciated. Let me know if you hear anything from your radiology colleague!